Mid-March is a good time to start transplants from seed. These include tomatoes, broccoli, brussel sprouts, cauliflower, celery and eggplant. To ensure healthy transplants, start these seeds in pathogen-free soil. Most garden centers sell sterile potting mixes, but home gardeners can use safe, non-chemical methods to sanitize small amounts of soil at home. Treat soil before seeding or transplanting. Soil to be treated should crumble easily and be without clods or large pieces of plant debris. The soil also must be moist, but not wet. Gently squeeze a handful of soil. When the hand is opened, the soil ball should break apart somewhat. If it doesn’t and if the ball cannot be broken by gently pushing on its top, the soil is too wet. If the soil is too dry, add water. Add any amendments — manure, compost or peat moss — before treatment. You can choose from four methods to sanitize soil at home. Oven Method– Spread soil not more than four inches deep in non-plastic containers, such as seed flats, clay pots and glass or metal baking pans. Cover each container tightly with aluminum foil. Insert a meat or candy thermometer through the foil into the center of the soil. Set the oven between 180° and 200° F. Heat the soil to at least 180° F; keep at this temperature for 30 minutes. Do not allow the temperature to go above 200° F. High temperatures may produce plant toxins. After heating, cool, remove containers from the oven and leave aluminum foil in place until ready to use. The heated soil will give off an odor. 1. Fill clean, quart-size plastic containers with very moist soil, perlite or cutting medium. Check the rims of the containers to make sure there is no aluminum of any kind because some yogurt containers come with a foil seal. Use clean plastic yogurt containers with lids on for sterilizing soil. This is done using a temperature probe inside a carousel-type microwave oven, heating to 200F and holding that temperature with the digital oven program for 20 minutes. Poke a hole through the plastic lids with a nail for steam ventilation. The temperature probe goes half way down into the soil through this hole in one of the containers. In a large microwave, up to 7 quart containers can be sterilized at a time, making this a very efficient way to heat sterilize soil. Allow to cool and tape over the hole in the lid to keep sterile until ready to use. 2. Place approximately 2 pounds of moist soil in a polypropylene bag. Leave the top open and place in the center of a microwave oven. Treat for 2½ minutes on full power of about 650 watts. After treatment close the top of the bag and allow the soil to cool before removing. Pressure Cooker Method– Pour several cups of water into the cooker. On a rack above the water, place shallow pans containing no more than four inches of soil. Level the soil, but do not pack it down. Cover each container with aluminum foil. Stack the containers to allow steam circulation. Close the lid, but leave the steam valve open somewhat until all the air is forced out and steam begins to escape. Then close the steam valve and heat at 10 pounds pressure for 15 minutes. Turn off the heat, allow the containers to cool and remove. Leave the aluminum foil in place until you use the soil. Steam Sterilization Without Pressure– Pour about an inch of water into the sterilizing container. Follow the soil preparation procedures for the pressure cooker method. Place filled containers on a rack to keep them out of the water. Close the lid and bring the water to a boil. Open the lid just enough to prevent pressure build-up. When steam begins to escape, continue boiling for 30 minutes. Then turn off the heat and replace the lid. Remove soil when cool. Many heavier soils and soils containing large amounts of organic matter may release toxic compounds when heated too long or at too high a temperature. These toxins can cause poor seed germination, plant growth abnormalities or plant death. The toxicity is caused by an accumulation of ammonium compounds, soluble organic compounds, minerals or salts that may occur during the heating process. Use a simple test to determine if the treated soil is toxic. Plant a few lettuce or other seeds with a high germination rate in the treated soil. If the seed does not germinate, toxic compounds may be present. To check the validity of the test, plant the same seeds in untreated soil. To start seeds indoors, fill containers with soil three-quarters inch from the rim. Place seeds on the soil surface and cover to the depth indicated on the seed packet. As a general rule, don’t cover more than four times the diameter of the seed. Water the seeds with a fine spray; avoid flooding the pots. Cover the containers with plastic sheets or glass panes to increase humidity; place them in a cool room (60 to 65° F) away from direct sunlight until germination. 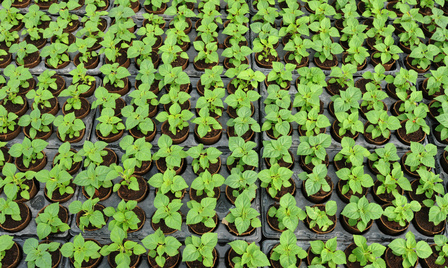 Once germination occurs, move containers into brighter light over a gradual 2-to-3 day period. When the first true leaves develop, thin to one seedling per container if using peat pots or partitioned trays. If seeds were planted in larger containers, transplant them to smaller containers or peat pots at this stage. Harden off seedlings about a week before planting time. (The last average frost-free dates are May 12 – 15.) To do this, gradually expose the seedlings to longer periods of outdoor temperatures (unless temperatures are below 50° F). Reduce watering slightly to help plants adjust to full exposure. For more information contact your local Colorado State University Cooperative Extension office. Photograph courtesy of Garden Gate magazine; Copyright, August home Publishing Co. Note: for professional grade sterilizers for soil and other growing medium, click here for Heavy Duty Soil Sterilizers manufactured in U.S.A.
Professional Grade Soil Sterilizers are an excellent alternative to other labor intensive methods, including the use of ovens that result in not only a mess, but long-lasting earthy odors which develop in ovens.